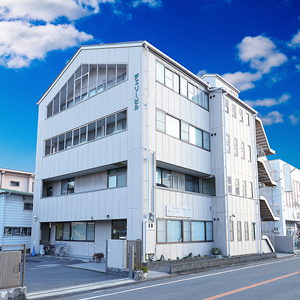 About Us | Matsuwaka Glass and Pearl Works Corporation. 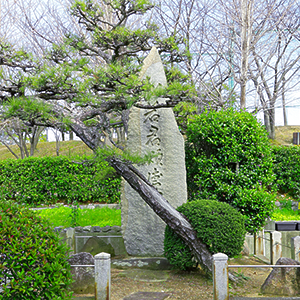 Some 130 years have passed since Matsuwaka began the manufacturing of imitation pearl and glass accessories, which has evolved as a major local industry of Izumi City. As the fifth generation heir of the founder of this company, I cannot but feel the gravity of the history my predecessors have established and entrusted upon myself. Given the globally competitive market with fierce competition among uncountable actors whether domestic or overseas, the foresight to predict the future and make sharp judgments, as well as the courage to take action and move forward are essential abilities for a company to continue developing its potential. Creative experiments based on originality and ingenuity that cannot be mimicked are also crucial factors that set a company apart from the rest of its competitors. We, at Matsuwaka Glass and Pearl Works, have been pursuing the possibility of fashion accessories by experimenting with a variety of different materials, with our flagship glass beads and imitation pearls that have developed with the company from the very beginning at the center. With a focus on major products such as necklaces, earrings, bracelets, and broaches, we consider it our mission to provide trustworthy, quality items to established fashion brands and the apparel industry of this country. We pride ourselves in facing each and every customer faithfully, leveraging all possible skills and technology we possess to deliver a quality that meets expectations. Our achievements to date are unspeakable without the efforts on part of our customers and the community which always provided us with a stable, reassuring ground. We hope for your continued patronage, as we all commit ourselves to continue our challenge with the spirit of discovering new things by studying the past. Showcases colored glass beads in the Third National Industrial Exhibition. Launches the colored glass bead, Izumi Bead. The Hari Bead wins Silver Prize in the Kansai Product Exhibition. 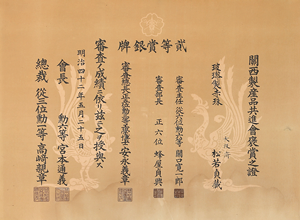 The Hari Bead is purchased by the Taisho Emperor, after its presentation at the Imperial General Headquarters during the large-scale military exercise in the Kinki region. Starts manufacturing of imitation pearls. Starts full-scale export to the United States. Second generation owner Kenzo Matsuwaka succeeds business operations. 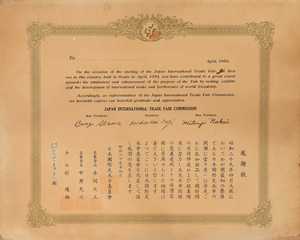 Suspends business in response to the Industrial Readjustment Act issued due to the Pacific War. Starts manufacturing of ampules for military use. Resumes business upon the end of the war. 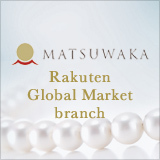 Reorganizes as the Matsuwaka Glass and Pearl Works Corporation. Kenzo Matsuwaka assumes position as the President and Representative Director. Receives an award for excellent merchandise in the Osaka International Exhibition. Third generation owner Hisao Matsuwaka succeeds business operations and assumes position as the President and Representative Director. Receives certification as a company contributing to the development of Japan through export. President and Representative Director Hisao Matsuwaka is awarded as an Industrial Contributor by the Governor of Osaka Prefecture. President and Representative Director Hisao Matsuwaka receives the Medal of Honour with Blue Ribbon from the Japanese Government. Completes construction of the new company building, the Cherry Building. President and Representative Director Hisao Matsuwaka is awarded the Gold and Silver Rays Class of the Order of the Sacred Treasure. Fourth generation owner Masami Matsuwaka succeeds business operations and assumes position as the President and Representative Director. President and Representative Director, Masami Matsuwaka is awarded as an Industrial Contributor by the Governor of Osaka Prefecture. Fifth generation owner Yohei Matsuwaka succeeds business operations and assumes position as the President and Representative Director. Completes construction of the plant for coating and spray coating.